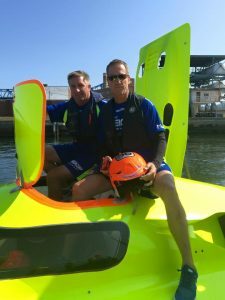 TNT Custom Marine’s Johnny Tomlinson recently competed alongside Jay Muller at the Fall River Race, throttling the Miss GEICO 41′ Victory–Built catamaran. Check out the article, below, by Johnny Saris, the OPA circuit writer at SpeedontheWater.com. Sharing the cockpit for the first time in their long and successful careers, veteran offshore powerboat racers John Tomlinson and Jay Muller ran the Miss GEICO replacement raceboat—a 41-foot Victory-built catamaran leased from Offshore Racing Services and formerly owned by the Spirit of Qatar team—to victory against Alex And Ani during yesterday’s Offshore Powerboat Association third annual Fall River Classic in Massachusetts. 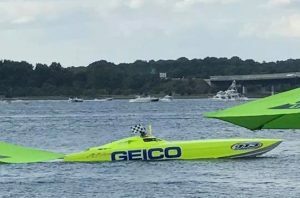 Tomlinson, who throttled the boat, and Muller, who handled the driving duties, stepped into the cat for Miss GEICO’s Scott Begovich and Marc Granet, who are taking time off after a tragic accident at the OPA event in St. Clair, Mich., that claimed the life of offshore racer Keith Holmes. “I’ve been competing against Johnny for 20-something years,” said Muller, who throttles the WHM Motorsports Skater Powerboats catamaran with owner/driver Billy Mauff on the Super Boat International circuit. “It’s about time we finally ran a boat together. Running with him is fantastic. He’s smooth and laid back.